A gas fireplace is an option for those who wish to have the look and feel of a fireplace without the maintenance of a wood fireplace. Instead of using wood logs to create a flame, gas fireplaces use a direct input of gas ignited to create flames. Occasionally, these fireplaces produce a whistling sound -- a sign of a problem within the unit. A whistling gas fireplace disrupts a peaceful home. 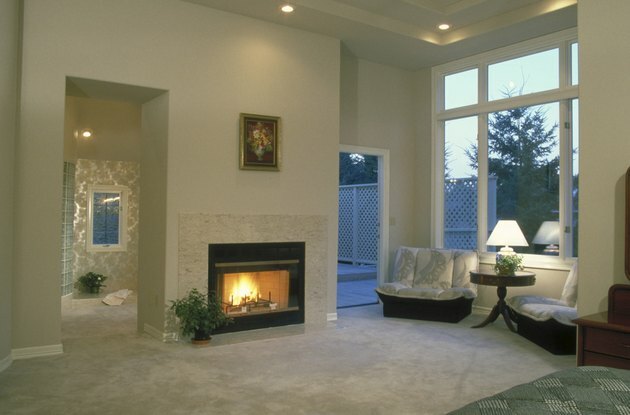 The gas enters a gas fireplace or gas fireplace log through a flexible connector tube. This tube must be installed with the gas log or when installing the gas fireplace unit. If the tube is improperly installed, or is not installed at all, a whistling sound may be produced by the fireplace. Furthermore, if the flexible tube is made of a corrugated material, the tube may produce whistling noises even when installed properly. Prevent this problem by exactly following the instructions in the owner's manual for your fireplace and by using only stainless steel or aluminum, noncorrugated connector tubes. Sometimes the problem causing the whistling noise in a gas fireplace has nothing to do with installation and everything to do with the quality of the fireplace itself. Cheaply or poorly constructed gas fireplace systems may produce a whistling noise regardless of how well they are installed and maintained. Prevent this problem by purchasing gas fireplace systems only from reputable dealers carrying brands you trust. A warranty and guarantee on the system usually allows you to replace the system if the problem is a result of a manufacturer's defect. A gas fireplace uses a pilot light to ignite the gas and create a flame, similar to the way a gas stove operates. If the pilot light is improperly set, a whistling sound may be produced. Pilot lights for gas fireplaces should be kept on a low setting and gradually increased to light the flame. If the pilot light is kept on a high setting, the result is a flame in the fireplace along with an annoying whistling sound effect. Check your fireplace's owner's manual for instructions regarding the proper setting of your fireplace's pilot light. Whistling in a gas fireplace may also be the result of an obstruction in the gas supply. The obstruction does not have to be anything big, as small bits of dust and dirt or even air in the gas supply may obstruct the flow of gas. When the gas supply becomes obstructed even slightly, the pressure of the gas moving against the obstruction causes a whistling noise. Keep the fireplace and all of its attachments as clean as possible and have your gas supply checked by a qualified professional to prevent whistling due to supply obstructions.